APARTMENT 1 (100 sq m) is located on the third floor. It has a separate entrance, a balcony and a terrace with garden furniture. The apartment consists of a spacious living room with three beds. The living room has an exit to the balcony offering a beautiful view of the old city center and the sea. It also includes a fully equipped kitchen. The two spacious bedrooms include two beds and an additional bed each. The apartment also has a bathroom with a shower cabin and a separate toilet. It can accommodate up to nine people. 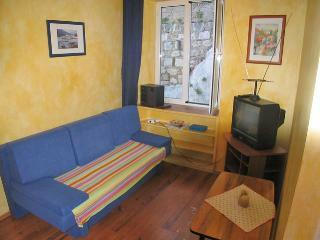 The apartment is equipped with a TV set, internet, an air-conditioner and a washing machine. The apartments may be rented for a short or long periods of time during the entire year. APARTMENT 2 (45 sq m) is located on the second floor and has a separate entrance. It consists of a living room with a foldable sofa for two adults, two rooms one of which has an additional bed, a fully equipped kitchen, and a bathroom with a shower cabin. The apartment is intended for 7 people. It offers a view of the sea and the old center of the city of Dubrovnik, as well as the Hilton Imperial Hotel. 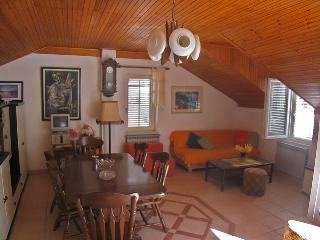 APARTMENT 3 (35 sq m) is located on the second floor and has a separate entrance. The apartment consists of a living room with a foldable sofa, a fully equipped kitchen, a bedroom and a bathroom with a shower cabin. It is intended for 4 people. There is a park under the house and we are 300m from the road. APARTMENT 1 (100 sq m) is located on the third floor. It has a separate entrance, a balcony and a terrace with garden furniture. The apartment consists of a spacious living room with three beds. The living room has an exit to the balcony offering a beautiful view of the old city center and the sea. 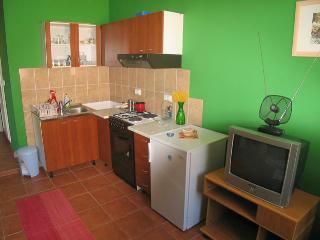 It also includes a fully equipped kitchen. The two spacious bedrooms include two beds and an additional bed each. The apartment also has a bathroom with a shower cabin and a separate toilet. It can accommodate up to nine people. The apartment is equipped with a TV set, internet, an air-conditioner and a washing machine. The apartments may be rented for a short or long periods of time during the entire year. APARTMENT 2 (45 sq m) is located on the second floor and has a separate entrance. It consists of a living room with a foldable sofa for two adults, two rooms one of which has an additional bed, a fully equipped kitchen, and a bathroom with a shower cabin. The apartment is intended for 7 people. 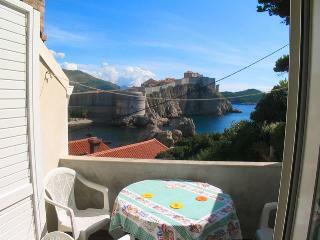 It offers a view of the sea and the old center of the city of Dubrovnik, as well as the Hilton Imperial Hotel. The apartment is equipped with a TV set, internet, an air-conditioner and a washing machine. The apartments may be rented for a short or long periods of time during the entire year. 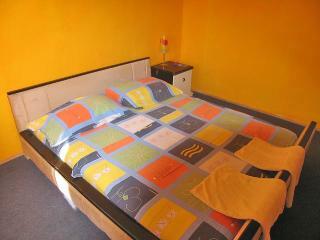 APARTMENT 3 (35 sq m) is located on the second floor and has a separate entrance. The apartment consists of a living room with a foldable sofa, a fully equipped kitchen, a bedroom and a bathroom with a shower cabin. It is intended for 4 people. 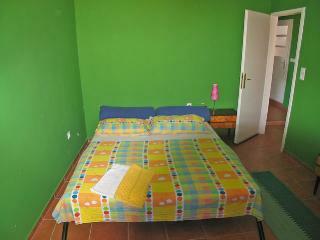 The apartment is equipped with a TV set, internet, an air-conditioner and a washing machine. The apartments may be rented for a short or long periods of time during the entire year. We are located by the historical center of the city of Dubrovnik, at a distance of 20 m from the sea and the bathing area. The 5-star Hilton Imperial Hotel and top-quality, world-known restaurants are located in the immediate vicinity of our apartments. We offer accommodation in apartments that will leave a lasting impression on you, to which you will gladly return, and where you will be equally gladly welcomed. This ancient, Mediterranean small town attracts the tourists for many reasons. Some wish to spend a pleasant vacation, some wish to explore cultural and historical monuments, and some want simply to relax and enjoy the intact nature. For reservation 10% in advance. The Mia Apartments, Dubrovnik are located in the immediate vicinity of the old center of the city of Dubrovnik, beneath the Lovrijenac Fort, in a quiet street, away from the city bustle. The luxurious Hilton Imperial Hotel is located at the distance of 200 m from our apartments, as are the famous restaurants Nautika and Orhan, which speaks in favor of the ideal location of our apartments. One of the 5 most beautiful beaches, according to the CNN research, namely the Banje Beach, is located at a distance of only 600 m from our apartments. The public transportation stop, a bank, a parking lot, a clothing store, a grocery, souvenir stores, cafes, restaurants and beauty salons are located within 100 m from the apartments. When you enter the city of Dubrovnik, look for signs leading towards the old city center. When you reach the main entrance into the old city center, your search ends. The street that leads you towards the sea will take you straight to our apartments. Welcome. The Ćilipi Airport is located 16 km from Dubrovnik. After landing at the Dubrovnik Airport, take a direct bus line from the airport. It will take you to the Dubrovnik Bus Terminal. There is a local bus stop in front of the Bus Terminal. The local bus will take you to the old city center. When you reach the main entrance into the old city center, your search ends. The street that leads you towards the sea will take you straight to our apartments. Welcome.